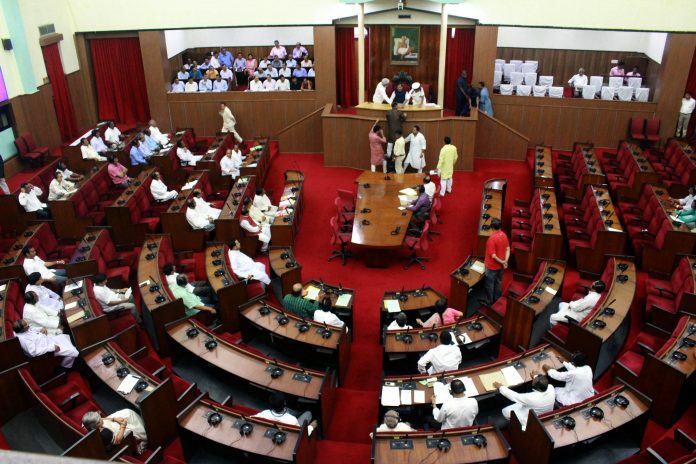 Bhubaneswar: Speaker Pradip Amat convened an all-party meeting to resolve the stalemate in the Odisha Assembly on Tuesday. It was adjourned for the fourth time earlier in the day due to the uproar by the Opposition Cong,ress and BJP members. The House hardly functioned for a minute during the first session due to uproar by the BJP members, who came down heavily on the state government for indulging in self-propagation in the name of capital investment through its Make-in-Odisha road show campaign while failing miserably in the utilisation of the Central fund for implementation of a number of ongoing Centrally-sponsored programmes in the state. As the din prevailed, the Speaker adjourned the House till 11.30 am. The Speaker had to re-adjourn the House till 3 pm as the Congress members rushed to the Well shouting anti-government slogans for not resolving the issues of the agitating Block Grant teachers. After the House session began at 3 pm, the leader of the BJP legislature party, K.V. Singhdeo and Opposition chief whip Tara Prasad Bahinipati urged the Speaker to convene the all-party meeting to resolve the issue of the striking Block Grant teachers. Amid the commotion, the Speaker adjourned the House twice till 4 pm before convening the all-party meeting.